Jan. 26, 2010 -- Niche Dutch sportscar maker Spyker buys Saab from General Motors for $400 million, with $74 million in cash, the rest in deferred shares. Jan. 5, 2011 -- Spyker says Saab sold 31,696 cars in 2010 after cutting its full-year target to 30,000 from 35,000 units. March 29 -- Saab halts production due to disputes over non-payment of suppliers. April 28 -- Sweden's Debt Office and GM give initial approval for an investment of 30 million euros in Saab by Russian investor Vladimir Antonov in exchange for a 29.9 percent stake. May 2 -- Saab lines up almost 60 million euros in funds to restart production after a month of stoppages. May 16 -- Spyker announces a deal with China's Pang Da Automobile Trade Co. Ltd. worth as much as 110 million euros. Saab restarts production on May 27. June 13 -- Spyker says it has signed a non-binding memorandum of understanding for Zhejiang Youngman Lotus Automobile Co. to take a 29.9 percent stake and Pang Da to take a 24 percent stake for a combined 245 million euros. 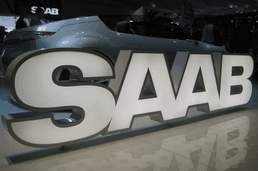 June 27 -- Saab says it has secured funds to pay wages and some suppliers, staving off the threat of collapse. Owner Swedish Automobile, until recently called Spyker, says an undisclosed Chinese company had ordered 582 Saabs for 13 million euros. July 4/5 -- A 255 million crown property sale and leaseback deal with a consortium headed by Hemfosa Fastigeheter, has been approved by Sweden's Debt Office and the EIB, easing Saab's plight. Sept. 21 -- Saab wins court protection from creditors while it awaits Chinese investment. Sept. 28 -- Swedish Automobile says it will sell its Spyker luxury sports car business to the private equity firm of racing car enthusiast Alex Mascioli for about 32 million euros. Oct. 28 -- Pang Da and Youngman agree to buy Saab for 100 million euros from Swedish Automobile. Oct. 31 -- Pang Da and Youngman say they are targeting sales of up to 55,000 Saab cars for 2012 and have promised a volume of up to 205,000 units per year longer term. Nov. 7 -- GM says it will stop supplying components and technology if the two Chinese companies succeed with their acquisition bid. Victor Muller, chief executive of Swedish Automobile, says GM's rejection of the proposed rescue plan means that negotiators will have to "go back to the drawing board" with Chinese investors Pang Da and Youngman Lotus. Dec. 7 -- Saab faces a fresh threat when a court-appointed administrator says its protection from bankruptcy should be removed due to a failure to secure Chinese investments. Dec. 13 -- Saab receives a first payment of 3.4 million euros from China's Zhejiang Youngman Lotus Automobile as it struggles to stay in business. Dec. 15 -- Sweden's Vanersborg District Court says Saab has put forward Lars Soderqvist of law firm Hokerberg & Soderqvist as its new administrator, having said the day before another lawyer called Lars-Henrik Andersson would take the position. Dec. 19 -- Saab says the rejection of a rescue plan for the company by GM has forced it to apply for bankruptcy, possibly putting the Swedish brand out of business after 64 years of producing cars.